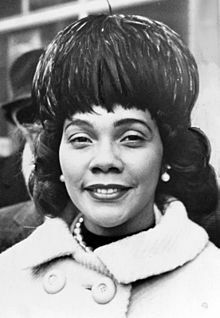 Coretta Scott King (April 27, 1927 – January 30, 2006) was an American author, activist, and civil rights leader. She was the widow of Martin Luther King, Jr.. Scott King helped lead the African-American Civil Rights Movement in the 1960s. Scott King played an important role in the years after her husband's 1968 assassination when she took on the leadership of the struggle for racial equality herself and became active in the Women's Movement. Scott King was born on April 27, 1927 in Heiberger, Alabama. She studied at Lincoln Normal School and at Antioch College. King was in a hospital in Rosarito Beach, Mexico after she had a stroke and had ovarian cancer. She died on January 30, 2006 in the hospital from a stroke and respiratory failure, aged 78. ↑ "Coretta Scott King". Women's History. Gale Virtual Reference Library. This page was last changed on 31 December 2017, at 06:39.